"គិមិង៉ាយ៉ុ" (君が代?, ទំព័រគំរូ:IPAc-ja; His Imperial Majesty's Reign) គឺជាភ្លេងជាតិរបស់ប្រទេសជប៉ុន។ Its lyrics are the oldest among the world's national anthems, and with a length of 11 measures and 32 characters "Kimigayo" is also one of the world's shortest. Its lyrics are from a waka poem written in the Heian period (794–1185), and the current melody was chosen in 1880, replacing an unpopular melody composed eleven years earlier. While the title "Kimigayo" is usually translated as "His Imperial Majesty's Reign", no official translation of the title or lyrics has been established in law. From 1888 to 1945 "Kimigayo" served as the national anthem of the Empire of Japan. When the Empire was dissolved following its surrender at the end of World War II, the State of Japan succeeded it in 1945. This successor state was a parliamentary democracy and the polity therefore changed from a system based on imperial sovereignty to one based on popular sovereignty. Emperor Shōwa was not dethroned, and "Kimigayo" was retained as the de facto national anthem. The passage of the Act on National Flag and Anthem in 1999 recognized it as the official national anthem. "Kimi" has been used either as a noun to indicate an emperor or one's lord (i.e., master) since at least the Heian period; as an honorific noun or suffix to indicate a person or most commonly as a friendly, informal word for "you." For example, the protagonist ទំព័រគំរូ:Nihongo3 of the Tale of Genji is also called ទំព័រគំរូ:Nihongo3. But before Nara period, the emperor was often called "ōkimi" (great lord); so it is controversial whether the word "kimi" in "kimigayo" had meant emperor or not originally. In Kamakura period, "Kimigayo" was used as a festive song among samurai and then became popular among the people in Edo period. In latter Edo period, "Kimigayo" was used in the Ōoku (harem of Edo Castle) and Satsuma-han (now Kagoshima Prefecture) as a common festive new year song. In those contexts, "kimi" never meant the emperor but only the Tokugawa shogun, the Shimazu clan as rulers of the Satsuma-han, guests of honour or all members of festive drinking party. After the Meiji Restoration, samurai from Satsuma-han controlled the Imperial Japanese government and they adopted "Kimigayo" as the national anthem of Japan. From this time until the Japanese defeat in World War II, "Kimigayo" was understood to mean the long reign of the emperor. With the adoption of the Constitution of Japan in 1947, the emperor became no longer a sovereign who ruled by divine right, but a human who is a symbol of the state and of the unity of the people. The Ministry of Education did not give any new meanings for "Kimigayo" after the war; this allowed the song to mean the Japanese people. The Ministry also did not formally renounce the pre-war meaning of "Kimigayo". "Kimi" indicates the Emperor, who is the symbol of the State and of the unity of the people, and whose position is derived from the consensus-based will of Japanese citizens, with whom sovereign power resides. And, the phrase "Kimigayo" indicates our State, Japan, which has the Emperor enthroned as the symbol of the State and of the unity of the people by the consensus-based will of Japanese citizens. And it is reasonable to take the lyric of "Kimigayo" to mean the wish for the lasting prosperity and peace of such country of ours. Parties opposed to the Liberal Democratic Party, which was in control of the government at the time Obuchi was prime minister, strongly objected to the government's meaning of kimi and "Kimigayo". From the Democratic Party of Japan, members objected due to the lack of any historical ties to the meaning. The strongest critic was Kazuo Shii, the chairman of the Communist Party of Japan, who strongly claimed that "Japan" could not be derived from "Kimigayo" because the lyrics only mention wishing for the emperor for a long reign. Shii also objected to the use of the song as the national anthem because for a democratic nation, a song about the emperor is not appropriate. Sazare-Ishi pebbles are believed to grow into boulders in some legends. A photo taken at Shimogamo Shrine in Kyōto. Franz Eckert's notes, presented to the Meiji-Tennō in 1880 (cover design by Curt Netto). The lyrics first appeared in the Kokin Wakashū, a poetry anthology, as an anonymous poem. The poem was included in many anthologies, and was used in a later period as a celebration song of a long life by people of all social statures. Unlike the form used for the current national anthem, the poem originally began with "Waga Kimi wa" ('you, my lord') instead of "Kimiga Yo wa" ('your reign'). The first lyrics were changed during the Kamakura period, while the rest of the lyrics stayed the same. Because the lyrics were sung on formal occasions, such as birthdays, there was no sheet music for it until the 19th century. In 1869, John William Fenton, a visiting Irish military band leader, realized there was no national anthem in Japan, and suggested to Iwao Ōyama, an officer of the Satsuma Clan, that one be created. Ōyama agreed, and selected the lyrics. The lyrics may have been chosen for their similarity to the British national anthem, due to Fenton's influence. After selecting the anthem's lyrics, Ōyama then asked Fenton to create the melody. After being given just two to three weeks to compose the melody and only a few days to rehearse, Fenton debuted the anthem before the Japanese Emperor in 1870. This was the first version of "Kimigayo". Ths was discarded because the melody "lacked solemnity", according to the Japanese government although others believe it is because the melody was actually "unsingable" for the Japanese. However, this version is still performed annually at the Myōkōji temple in Yokohama, where Fenton served as a military band leader. Myōkōji serves as a memorial to him. In 1880, the Ministry of the Imperial Household adopted a new melody composed by Yoshiisa Oku and Akimori Hayashi. The composer is often listed as Hiromori Hayashi, who was their supervisor and Akimori's father. Akimori was also one of Fenton's pupils. Although the melody is based on a traditional mode of Japanese court music, it is composed in a mixed style influenced by Western hymns, and uses some elements of the Fenton arrangement. The German musician Franz Eckert applied the melody with Western style harmony, creating the second and current version of "Kimigayo". The government formally adopted "Kimigayo" as the national anthem in 1888 and had copies of the music and lyrics sent overseas for diplomatic ceremonies. By 1893, "Kimigayo" was included in public school ceremonies due to the efforts of the then Ministry of Education. At the turn of the 20th century, "Kimigayo" was beginning to be closely associated with the idea of honoring the Emperor. It was also associated as a part of Japanese education. However, opinions expressed in an Osaka paper in 1904 calls "Kimigayo" a song for the imperial family and not the state as a whole. Uchimura Kanzo, a Christian leader in Japan, stated at the turn of the 20th century that "Kimigayo" is not the anthem of Japan by saying the song's purpose is to praise the emperor. According to Kanzo, a national anthem should express the feelings of the people. The Japanese were not familiar with "Kimigayo" as the anthem until there was a surge of celebrations after victories in the First Sino-Japanese and Russo-Japanese Wars. Previously, papers were critical of fellow Japanese who could not sing "Kimigayo" properly at ceremonies overseas. During World War II, the Japanese Empire ordered that schoolchildren, both from its homeland and its colonies, were to sing the "Kimigayo" anthem and salute Emperor Hirohito every morning. During the American occupation of Japan, there were no directives by the Supreme Commander for the Allied Powers to restrict the use of "Kimigayo" by the Japanese government. This was different from the regulations issued that restricted the use of the Hinomaru flag. Along with the encouragement to use "Kimigayo" in the schools to promote defense education and patriotism, the national broadcaster NHK began to use the song to announce the start and ending of its programming. The Act on National Flag and Anthem was passed in 1999, choosing both the Hinomaru and "Kimigayo" as Japan's national symbols. The passage of the law stemmed from a suicide of a school principal in Hiroshima who could not resolve a dispute between his school board and his teachers over the use of the Hinomaru and "Kimigayo". Prime Minister Keizō Obuchi of the Liberal Democratic Party (LDP) decided to draft legislation to make the Hinomaru and "Kimigayo" official symbols of Japan in 2000. His Chief Cabinet Secretary, Hiromu Nonaka, wanted the legislation to be completed by the 10th anniversary of the coronation of Akihito as Emperor. This is not the first time legislation was considered for establishing both symbols as official. In 1974, with the backdrop of the 1972 return of Okinawa to Japan and the 1973 oil crisis, Prime Minister Tanaka Kakuei hinted at a law being passed legalizing both symbols. Before the vote, there were calls for the bills to be separated at the Diet. Waseda University professor Norihiro Kato stated that "Kimigayo" is a separate issue more complex than the Hinomaru flag. Attempts to designate only the Hinomaru as the national flag by the DPJ and other parties during the vote of the bill were rejected by the Diet. The House of Representatives passed the bill on July 22, 1999, by a 403 to 86 vote. The legislation was sent to the House of Councilors on July 28 and was passed on August 9. It was enacted into law on August 13. "Kimigayo" played at a volleyball tournament in Ōsaka. The lyrics and musical notation of the anthem are given in the second appendix of the Act on National Flag and Anthem. 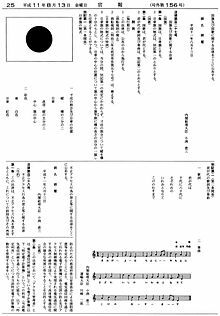 As for the sheet music itself, it displays a vocal arrangement with no mention of tempo and all of the lyrics in hiragana. The anthem is composed in 4/4 (common time) in the Dorian mode. The Act on National Flag and Anthem does not detail how one should show respect during performances of "Kimigayo". In a statement made by Prime Minister Obuchi, the legislation will not impose new regulations on the Japanese people when it comes to respecting the flag or anthem. However, local government bodies and private organizations sometimes suggest or demand certain protocols be followed. For example, an October 2003 directive by the Tokyo Metropolitan Government required teachers to stand during the national anthem at graduation ceremonies. While standing, the teachers are required to sing "Kimigayo" while facing the Hinomaru. United States military personnel are required by regulations to render honors with a hand salute, or when in civilian dress, to place their right hand over their heart when "Kimigayo", The Star-Spangled Banner, or any other national anthem is performed. The Act on National Flag and Anthem also does not dictate when or where "Kimigayo" should be played. The anthem, however, is commonly played at sporting events inside of Japan, or at international sporting events where Japan has a competing team. At sumō tournaments, "Kimigayo" is played before the awards ceremony. Since the end of World War II, the Ministry of Education has issued statements and regulations to promote the usage of both the Hinomaru and "Kimigayo" at schools under their jurisdiction. The first of these statements was released in 1950, stating that it was desirable, but not required, to use both symbols. This desire was later expanded to include both symbols on national holidays and during ceremonial events to encourage students on what national holidays are and to promote defense education. The Ministry not only took great measures to explain that both symbols are not formally established by law, they also referred to "Kimigayo" as a song and refused to call it the national anthem. It was not until 1977 that the Ministry referred to "Kimigayo" as the national anthem (国歌, kokka) of Japan. In a 1989 reform of the education guidelines, the LDP-controlled government first demanded that the Hinomaru flag must be used in school ceremonies and that proper respect must be given to it and to "Kimigayo". Punishments for school officials who did not follow this order were also enacted with the 1989 reforms. The 1999 curriculum guideline issued by the Ministry of Education after the passage of the Law Regarding the National Flag and Anthem decrees that "on entrance and graduation ceremonies, schools must raise the flag of Japan and instruct students to sing the "Kimigayo" (national anthem), given the significance of the flag and the song." Additionally, the ministry's commentary on 1999 curriculum guideline for elementary schools note that "given the advance of internationalization, along with fostering patriotism and awareness of being Japanese, it is important to nurture school children's respectful attitude toward the flag of Japan and "Kimigayo" as they grow up to be respected Japanese citizens in an internationalized society." The ministry also stated that if Japanese students cannot respect their own symbols, then they will not be able to respect the symbols of other nations. According to a survey conducted by TV Asahi, most Japanese people perceived "Kimigayo" as an important song even before the passage of the Act on National Flag and Anthem in 1999. However, a poll in the same year conducted by the Mainichi Shimbun found that most respondents opposed legislation making it the national anthem or felt the Diet should take more time in passing such a law. Many Japanese students, who must sing the song at entrance and graduation ceremonies, say they cannot understand the old language of the lyrics and are not educated on its historical uses. Controversies surrounding the use of the anthem in school events still remain. Japan's national anthem is deemed the world's most controversial due to its post-war history. Schools have been the center of controversy over both the anthem and the national flag. The Tokyo Board of Education requires the use of both the anthem and flag at events under their jurisdiction. The order requires school teachers to respect both symbols or risk losing their jobs. In 1999, several teachers in Hiroshima refused to put up the anthem while the Hiroshima Education Board demanded that they do so. As the tension arose between them, a vice-principal committed suicide. A similar incident in Osaka in 2010 also occurred, with 32 teachers refusing to sing the song in a ceremony. In 2011, nine more teachers joined the rebellion, along with another eight in 2012. Hashimoto Toru, the mayor of Osaka, slated the teachers as "It was good that criminals [teachers] who are intent on breaking the rules [of not singing the anthem] have risen to the surface [public]". Some have protested that such rules violate the United Nations Universal Declaration of Human Rights and the "freedom of thought, belief and conscience" clause in the Constitution of Japan, but the Board has argued that since schools are government agencies, their employees have an obligation to teach their students how to be good Japanese citizens. Teachers have unsuccessfully brought criminal complaints against Tokyo Governor Shintarō Ishihara and senior officials for ordering teachers to honor the Hinomaru and "Kimigayo". After earlier opposition, the Japan Teachers Union accepts the use of both the flag and anthem; the smaller All Japan Teachers and Staffs Union still opposes both symbols and their use inside the school system. In 2006, Katsuhisa Fujita, a retired teacher in Tokyo, was threatened with imprisonment and fined 200,000 yen (roughly 2,000 US dollars) after he was accused of disturbing a graduation ceremony at Itabashi High School by urging the attendees to remain seated during the playing of the anthem. At the time of Fujita's sentence, 345 teachers had been punished for refusing to take part in anthem related events, though Fujita is the only man to have been convicted in relation to it. On September 21, 2006, the Tokyo District Court ordered the Tokyo Metropolitan Government to pay compensation to the teachers who had been subjected to punishment under the directive of the Tokyo Board of Education. The then Prime Minister Junichiro Koizumi commented, "It is a natural idea to treat the national anthem importantly". The ruling has been appealed by the Metropolitan Government. Since October 23, 2003, 410 teachers and school workers have been punished for refusing to stand and sing the anthem as ordered by school principals. Teachers can also be punished if their students do not stand while "Kimigayo" is played during school ceremonies. On 30 May 2011 and 6 June 2011, two panels of the Supreme Court of Japan ruled that it was constitutional to require teachers to stand in front of the Hinomaru and sing the Kimigayo during school ceremonies. In making the ruling, the panels ratified the decision of the Tokyo High Court in ruling against 13 teachers who had asked for court relief after being disciplined between 2003 and 2005 for refusing to stand and sing the anthem. Outside of the school system, there was a controversy regarding "Kimigayo" soon after the passage of the 1999 law. A month after the law's passage, a record containing a performance of "Kimigayo" by Japanese rocker Kiyoshiro Imawano was removed by Polydor Records from his album Fuyu no Jujika. Polydor did not want to attract harassment from far-right uyoku dantai groups. In response, Imawano re-released the album through an independent label with the track in question. ↑ ៣,០ ៣,១ 新村出記念財団(1998). A dictionary of Japanese 『広辞苑』 ("Kōjien"), 5th edition. Published by Iwanami Shoten, Publishers. ↑ Goodman, Neary 1996, ទទ. 78. ↑ Marshall, Alex (2016)។ Republic or Death! Travels in Search of National Anthems។ London: Windmill Books។ ទំ. 104។ ល.ស.ប.អ. 9780099592235។ https://books.google.com/books/about/Republic_or_Death.html?id=GeasCAAAQBAJ&redir_esc=y។ ""Fenton's effort was overhauled in 1880 because it turned out to be completely unsingable if you were Japanese - 'Japanese is not a tonal language, but it has its highs and lows, and he got it completely wrong,'Professor Kazuo Fukushima, the director of Japan's Music Historiography Research Institute, told me - but after the rework it grew in prominence, especially as Japan's ruling elite tried to create a modern country...""
↑ Hermann Gottschewski: "Hoiku shōka and the melody of the Japanese national anthem Kimi ga yo", in: Journal of the Society for Research in Asiatic Music (東洋音楽研究), No. 68 (2003), pp. (1)-(17). Published by The society for Research in Asiatic Music Archived 2009-02-11 at the វេយប៊ែខ ម៉ាស៊ីន..
↑ Goodman, Neary 1996, ទទ. 79. ↑ Goodman, Neary 1996, ទទ. 81. ↑ Goodman, Neary 1996, ទទ. 82. ↑ Aspinall 2001, ទទ. 126. ↑ Goodman, Neary 1996, ទទ. 82–83. ↑ Democratic Party of Japan. 国旗国歌法制化についての民主党の考え方 [The DPJ Asks For A Talk About the Flag and Anthem Law]; 1999-07-21 [archived July 28, 2011; Retrieved 2010-01-17]. Invalid language code..
↑ Democratic Party of Japan. 国旗・国歌法案、衆院で可決　民主党は自主投票 [Flag and Anthem Law Passed by the House, DPJ Free Vote]; 1999-07-22 [archived July 28, 2011; Retrieved 2010-01-18]. Invalid language code..
↑ National Diet Library. 第１４５回国会　本会議　第４７号; 1999-07-22 [Retrieved 2010-01-17]. Invalid language code..
↑ House of Representatives. 議案審議経過情報: 国旗及び国歌に関する法律案; 1999-08-13 [archived 2011-03-23; Retrieved 2010-01-17]. Invalid language code..
↑ ៣៤,០ ៣៤,១ Goodman, Neary 1996, ទទ. 81–83. ↑ Trevor 2001, ទទ. 78. ↑ Hiroshima Prefectural Board of Education Secretariat. 学習指導要領における国旗及び国歌の取扱い [Handling of the flag and anthem in the National Curriculum]; 2001-09-11 [archived 2011-07-22; Retrieved 2009-12-08]. Invalid language code..
↑ Ministry of Education. 小学校学習指導要領解説社会編，音楽編，特別活動編 [National Curriculum Guide: Elementary social notes, Chapter music Chapter Special Activities]; 1999 [archived 2006-03-19]. Invalid language code..
↑ Aspinall 2001, ទទ. 125. ↑ Asahi Research. TV Asahi. 国旗・国歌法制化について [About the Law of the Flag and Anthem]; 1999-07-18 [archived 2008-05-23; Retrieved 2008-03-11]. Invalid language code..
↑ Japan Times. Japan Times. Flag-anthem law no end to controversy; 1999-07-09 [Retrieved 2015-12-21]. (អង់គ្លេស). ↑ Japan Times. Japan Times. [www.japantimes.co.jp/news/1999/07/22/national/kimigayo-controversy-leaves-students-indifferent-confused/ ‘Kimigayo’ controversy leaves students indifferent, confused]; 1999-07-09 [Retrieved 2015-12-21]. (អង់គ្លេស). ↑ Marshall, Alex (2016)។ Republic or Death! Travels in Search of National Anthems។ London: Windmill Books។ ទំ. 99–100។ ល.ស.ប.អ. 9780099592235។ https://books.google.com/books/about/Republic_or_Death.html?id=GeasCAAAQBAJ&redir_esc=y។ ""All anthems stir up controversy at some point...But no matter how heated such controversies get, none comes close to that around Kimigayo. It's a conflict that's been going on in Japan's schools for over 70 years. Teachers have lost jobs because of it. They've received death threats because of it. Parents have been left dazed by it, worrying about their children's future. And yes, Toshihiro Ishikawa committed suicide because of it."" ↑ Heenan 1998, ទទ. 206. Government of Japan. 国旗及び国歌に関する法律 (法律第百二十七号) [Act on National Flag and Anthem, Act No. 127]; 1999-08-13 [Retrieved 2010-02-06]. Invalid language code..